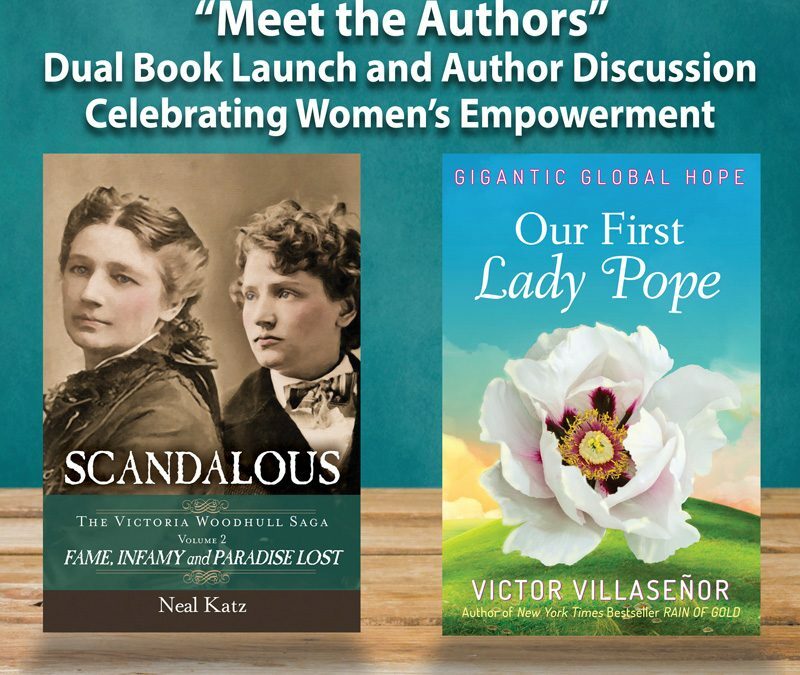 It’s great to arrive in San Diego to co-host a Dual Book Launch with the most honored living Latin American author, Victor Villaseñor, as we release our newest books, both celebrating Women’s Empowerment. My debut novel, OUTRAGEOUS: Rise to Riches garnered twelve literary prizes. This second volume of three, SCANDALOUS: Fame, Infamy, and Paradise Lost reveals the very first #MeToo event in America, and the first woman to be nominated by a national party to run for President—in 1872. Reading Victoria’s speeches and the party’s platform sound as if they are current front page news stories—the similarity is uncanny. I chose to write The Victoria Woodhull Saga because this heroic woman and her sister should be icons standing for overcoming adversity and the ability to manifest a remarkable and impactful life. This story touches me deeply as I too have suffered, endured and overcome many of the same tribulations. Victor’s book, Our First Lady Pope, recounts his personal journey when he was invited to speak to a group of retired nuns and priests. This became a life-altering experience of forgiveness and collective vision for Our First Lady Pope; a way of Hope, Love and Joy uniting all the churches with Feminine Energy throughout the globe. You may know Victor for his epic bestseller, Rain of Gold. I look forward to seeing old friends and new fans, from my old hometown in North County San Diego. If you are unable to attend in person, there will be a Facebook Live event and videos will be posted in the coming weeks. It is sure to be filled with lively discussion you won’t want to miss! Then be sure to pre-order both our books on Amazon or your favorite online bookseller.